Listed Premiere Horizon Alliance Corp. (PHA) has inked a P15 billion funding facility with Sama Global Investment to bankroll its tourism and infrastructure projects. The agreement also gives Sama Global the option to convert, in whole or in part, the P15 billion loan into an ownership of up to 60 percent in PHA by 2021. Premiere said the loan would have a term of nine years with a fixed interest of 1.25% per annum payable yearly. The money will also be used to fund ventures in tourism, power generation and financial services. Headquartered in Doha, Qatar, Sama Global is a global investment management firm that provides a range of investment strategies to serve a broad spectrum of client needs. 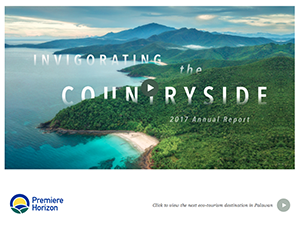 Premiere Horizon is a countryside enabler and has been undertaking two landmark projects in the real estate and tourism sectors. PHA is developing a master-planned tourism estate in Puerto Princesa City that brings together serene mountainside resorts and beach retreats through its West Palawan Premiere subsidiary.